PLA means polylactic acid,Which is made from 100% annually renewable resources,e.g.corn,cassava. PLA fiber - Poly Lactic Acid Fiber is a new generation of green, environmental-friendly& reproducible fiber with great potential and is 100% biodegradation material, which is made by natural corn starch or plant fiber through fermentation and polymerization. So PLA fiber is environment friendly and is the best substitute for traditional wood and plastic products. 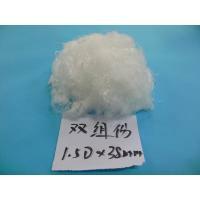 We developed PLA fiber with new technology, thus good quality and competitive price. 100% From Plant Not Oil. Application: widely used in thermal-bonding nonwoven, wetlaid/airlaid nonwoven/paper. Characteristics: natural loft, easy care and durability, hypoallergenic, good resilience, wash fastness, low flammability and smoke generation, no environmental contamination.